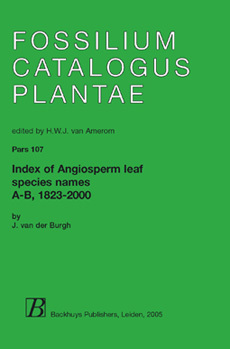 During work on leaf impressions/compressions the need of an index of names and descriptions of angiosperm leaf species became evident. It also was of value to know where, when and by whom they were created or used. Therefore this index was made, centered on the literature available in the Netherlands and focusing on the northern hemisphere. The author is aware that much of the published material is missing in this list; nevertheless he hopes that this index may lead to a more easy approach of the literature on leaf impressions/compression fossils and the avoidance of the creation of homonyms. In this index only genera and species are treated, taxa of minor order are not included. The species are listed in alphabetical order and the literature is cited in chronological and alphabetical order. Publications giving only listings of species without comment are omitted; only publications with a description are used. When descriptions are given in more than one publication of an author of a combination of authors, the later publications are listed chronologically behind the first one without repeated citing of the name(s) of the author(s). The original description is marked with an asterisk behind the publication. When the original description is repeated in later publications, these are also marked with an asterisk.